From 27th to 28th April 2014, FORLAND organized training course on “Institutional and policy of forestry in Viet Nam” for member organizations at Hue city. FORLAND is the amalgamation of Land Rights Network Network - LRN (as a LNGO group in Central Vietnam) and Forest and Land Union forest land in order to create diversity and strengthening cooperation relationship, and cooperation with the press and media to influence the decisions of policy-makers. FORLAND is a network of local non-governmental organizations and activities together for the purpose of supporting ethnic minority and mountainous areas of access land, forest fairly, including: Center for Rural Development in central Vietnam (CRD), People and Nature Reconciliation (PanNature), Center for indigenous Knowledge Research and Development (CIRD), Consultative and Research Center for Natural Resources Management (CORENARM), Center for Social Research and Development (CSRD), Rural Development and Poverty Reduction Fund (RDPR), and Centre for Research and Consultancy on Natural Resources Conservation and Sustainable Development (CRCSD). This training course is activity within the framework of the project “Community consultation about Law on Forest Protection and Development” of FORLAND, was sponsored by Oxfam England. Dr. Nguyen Quang Tan, Forestry specialist, National coordinator of the Center for People and Forests (RECOFTC) and MSc. 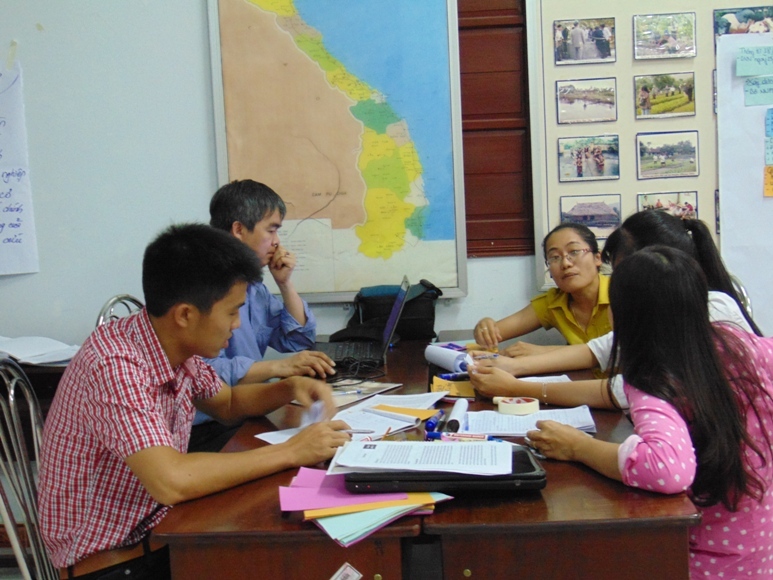 Hoang Huy Tuan, Lecturer at Hue University of Agriculture and Forestry participated as trainers. The trainees are mostly representatives from seven member organizations. At training course, the trainees had also practiced to policy analyse exercise and specific applied for the issue based projects (IBPs) that was conducted by FORLAND.As a results, groups discuss, analyse the institutional and define the stakeholders join in policy implementing and founding.